When it comes to both key passes and assists, Leighton Baines was main man again for Everton last season. There isn’t another full back in the big leagues who comes close to being the main man for his team on these measures year in, year out like Leighton is. My arl fella has said it, the forums have said it, and even the uber-positive Roberto Martinez intimated it when he recently mourned Baines’ lack of link-up with the injured Steven Pienaar. I’ve heard an argument that Martinez took a more defensive approach after the early season battering by yanking the reins on both full backs movement forward. The numbers don’t really back this up. Firstly, Seamus Coleman didn’t see a drop in his touch numbers like Baines did. And as the season wore on, while Baines was receiving less ball, he was receiving it (on average) the same distance into the opposition half as he always was. 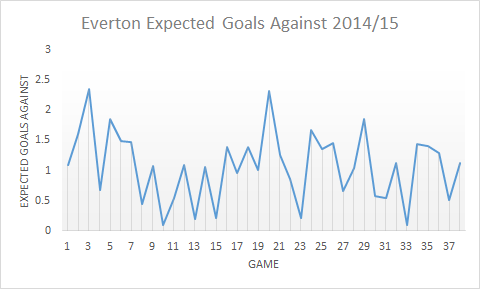 Everton were letting up fewest chances during autumn and the run up to Christmas when Sylvain Distin had his most regular stint in the side. Unfortunately for the Frenchman, it also coincided with the team conceding near enough every time the opposition got forward to get a shot on target. Distin was making ricks when it mattered and he got the chop after Boxing Day. But as we can see, Everton started letting up more chances again when Disty got binned. 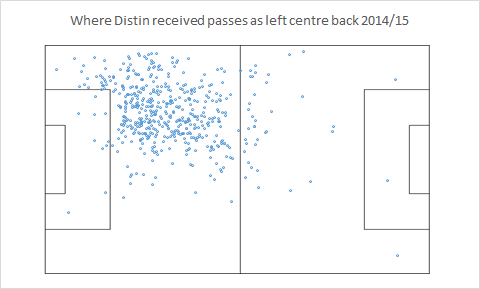 No Distin also impacted Everton’s distribution from the back because Phil Jagielka moved to the left side of defence for the rest of the season. 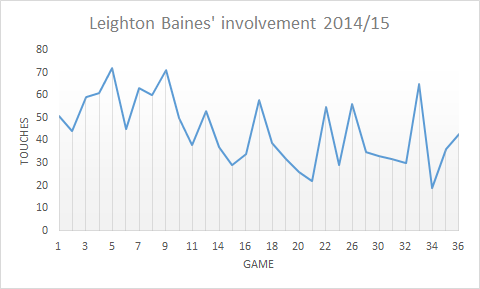 And this is a big reason why Baines became less involved. These graphics show both centre-backs only when they played with Baines. 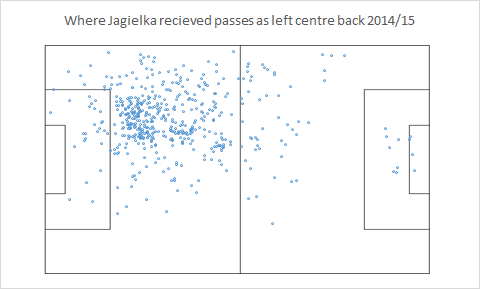 Consider that Jagielka played over 400 minutes with Baines than Distin did, and then take another look at them. It’s public knowledge that there was a fall out between Distin and Martinez. 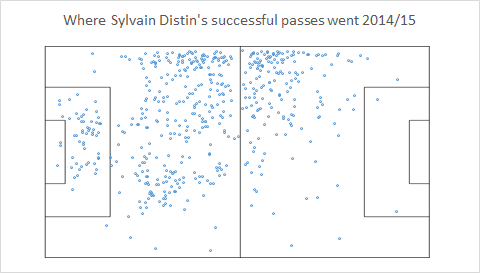 Was Distin dropped because of this, because of his mistakes or to change the shape of the side as demonstrated? Call me cynical but for me, it’s more likely a mix of the first two reasons. The changing dynamic was more a result of Distin and Jagielka’s differing styles, footedness and physical attributes than anyone following strict orders from the manager. There’s a lesson in here somewhere about scouting players in isolation, but that’s a whole different discussion.